And I don't mean that - mom, I'm not feeling very well, don't think I can go to school today, and she's like - Sure! I'll take a VAB-dag today and make you some beacon and eggs (win win situation). I'm talking about that in bed alone, sitting and shivering for seven days straight-sick. Damn, that's how I started this new year, I guess that's the flip side to working at a hospital (not that I've figured out the good side yet). It's '08 and I'll gladly follow my dear DBTYarians footstep by writing about the year behind us. While reading the previous posts I realized how few full length albums I listen to nowadays, I mean, its embarrassing when you get asked a question like "what did you think of the new Kanye West album?" and your answer is blank. But hey, I easily spend about 3-4 hours a day going through various blogs, listening to remixes, blends, mashups, mashdowns, and a whole galaxy of multicolored uppers, downers, laughers and screamers. I remember when I was bitching about how many crappy radio-singles I needed to go through everyday, that's nothing compared to the huge amount of blog music-ish that people post nowadays (like this one). On that note, here's a time saving list for those of y'all out there still reading. These tracks have had a huge impact on me this last year but aren't necessarily 07 releases, I'm always one step behind the movement. Ciara meets Tim Dolla, rnb meets Bmore (RNBmore). This fusion is simply perfect. It's from the The Dew Doo Ronomy EP, released digitally on Unruly Records . This needs to be played on a let your neighbor hear it-volume. Released in 1989 and a diamond among many others in my newly found soundscape. Not exactly your typical greatest of ´07 post, but 80s music definitively made a mark on me last year. When I talk about 80's, I mean that nasty synthetic bass *hit. With Daft Punk releasing their sample CD this year I know that I'm not the only one liking the sound. TTL writes: "Even the most jaded hater will crack a smile for this one", and I can't find a better description of this great track, released early last year. Jam had a sweet deal on a couple of studio-speakers late last summer, and I decided not to sleep on it. But remember this, being stranded on Odengatan with a unmovable box filled with a hi-quality sound system at rush hour can be painful, in ways you can't imagine. Safely home I realized that this track, and perhaps the whole hyphy-movement, is likely made to try out your speakers low frequency spectrum. Expect a follow up to Slappers for Dummies this year. Spending time with my fellow DBTYarians made a mark on my ears, this is a excellent example of that. I have such mixed feelings towards this "new" sound called electro (great brand name given to this genre btw, not at all confusing). Buy hey, when I hear this I just want to throw my t-shirt off like the Incredible Hulk! Frikkin awesome V! Setting the standard for 2008!!! yeah, everyone of them where tunga som fan! muchas gracias senor! 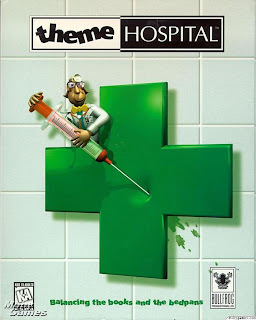 Me gillar Theme Hospital very much!